Everyone was excited. Flat Stanley had been gone for six weeks and today was the day he was coming home! The day started with a chapel service for the students and our many visitors in the gym. "Here he comes!" someone shouted. We were all prepared. 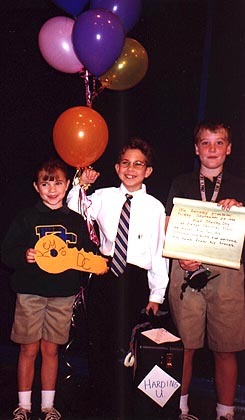 We had balloons for him, a key to the campus and a proclamation in his honor. After chapel we went to our classrooms. We had almost sixty visitors; parents, grandparents, friends, and even little brothers and sisters. Each student showed his/her poster and told about Stanley's travels. Would you like to look at some of our posters? When each child finished, we put a dot on the state Stanley had visited. If it was outside the United States, we wrote the name of the country and put a dot by it. Our parents helped us to make game boards. We each had a list of all the states and capitals and a blank board with 25 squares on it. We each chose 25 states and capitals, cut them out, and glued them on the squares. Later we used our 1 inch tiles and played STANO as our teacher called out the states and capitals. One of the children in Mrs. Sargent's 2C class began singing. "There was a boy who traveled far. And Stano was his name-o. And Stano was his name-o." It sounded a little like B-I-N-G-O and we loved it! We had a picnic lunch outside and played on the playground. That afternoon we toasted Stanley with hot chocolate, just like his family did in the book. Mrs. Stigers and the children in 2B. This page was created by Mrs. Stevens, teacher of class 2A. 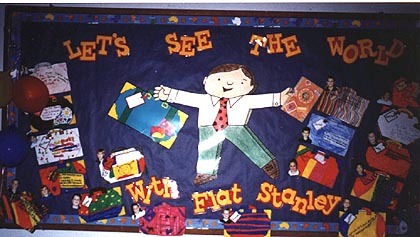 DC second grade teachers have developed Lesson Plans for Flat Stanley and seven other children's books. In 1914 a little girl was "mailed" to her grandmother when her parents could not afford to buy a train ticket for her. You will enjoy reading about this delightful story called Mailing May. Our teacher read the story to us in the classroom. The featured song is "Down by the Station"
Thanks Maggie for permission to use it. To view the lyrics for this song.